During the Create Event process you may wish to customize your event page and/or see how your event page looks as you make changes. This can be accomplished on the Themes and Preview pages. You can navigate to the Themes and Preview pages by clicking the Themes or Preview tab on either side of the screen, or by clicking the Themes or Preview button on the menu bar at the top of each page. 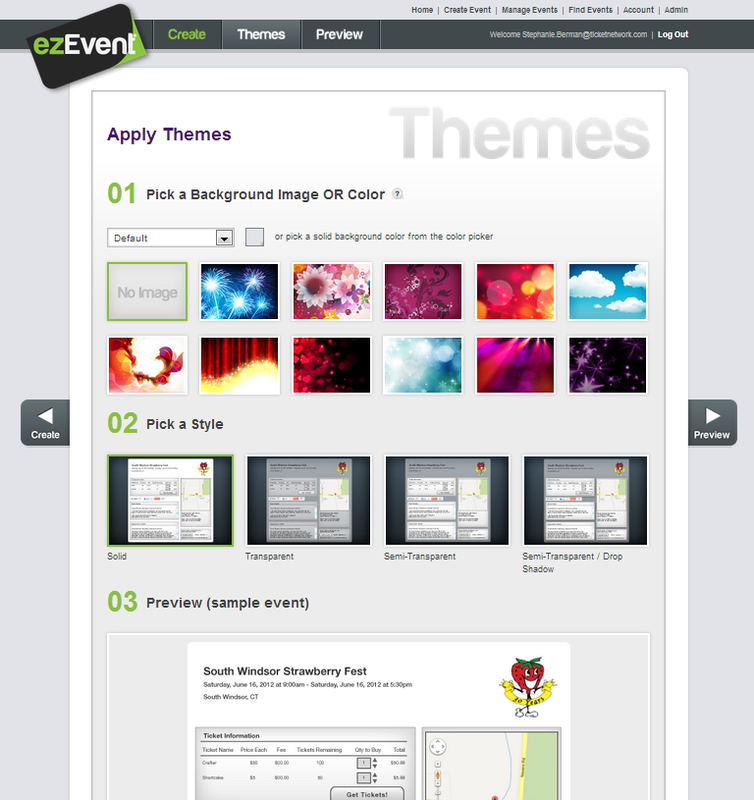 ezEvent® Themes add a level of style to any event. You have options for many solid colors, as well as vibrant background images with abstract and non-abstract designs. To create a Theme for your event, simply select a background image or color to display behind your event page. The background image or color will frame the event page and be visible around all four sides of the page. While you are on the Themes page you are able to pick a background image or color from a library of options. You also have the option to upload a custom image for your background. To make your selections, go to the "01 Pick a Background Color OR Image" section at the top of the page. If you would like your event page background to be a solid color, click on the color picker square to choose from one of the preset colors. Your choice will display instantly in the "03 Preview (sample event)" area at the bottom of the page. If you would like to select a background image, you can choose from one of the provided graphics simply by clicking on the graphic you like. Your choice will display instantly in the "03 Preview (sample event)" area at the bottom of the page. Clicking the first image in the library (No Image) will reset your theme by restoring the default settings. If you have suggestions for new background images, send an email to support@ezevent.com with your recommendations. Background options will be updated frequently! Holidays: Valentine's Day, Memorial Day, July 4th, Halloween, Thanksgiving, New Year's, Christmas, Hanukkah, and Kwanzaa, etc. Occasions: Weddings, Birthdays, Graduations, Births, Anniversaries, Parties, Retirements, Promotions, etc. Sports: Baseball, Football, Basketball, Hockey, Soccer, Lacrosse, Golf, Tennis, Skiing, Skating, etc. Months: January, February, March, etc. If you decide to use a custom image for your background, you must add it to your Custom Library. To add images to your Custom Library, select “Custom Library” from the dropdown menu and then click the Upload Image(s) button to upload the file(s) from your computer. On the Themes page you can select from four different background display styles for your event page: Solid, Transparent, Semi-Transparent, or Semi-Transparent / Drop Shadow. The background may or may not be visible depending on the transparency you choose. To select a style, go to the "02 Pick a Style" section on the middle of the page. Click on one of the four options and your choice will display instantly in the "03 Preview (sample event)" area at the bottom of the page. The default style setting is Solid. Solid: The background does NOT show through the event page. Transparent: The background shows through the event page in its entirety creating a spectacular effect if used properly. It is important to make sure the ticket box and other text is readable when selecting this style. Semi-Transparent: The background partially shows through the event page in its entirety. Semi-Transparent / Drop Shadow: The background partially shows through the event page, and the right side and bottom have a drop shadow. This option really jumps off the screen. The “03 Preview (sample event)" section at the bottom of the page allows you to see the theme you chose on a sample event. Once you’ve made all of your selections, and it looks the way you want it to, click the Save button at the bottom of the page so that your Theme goes into effect. To see your how your event page looks with the newly created Theme, go to the Preview screen by clicking the Preview tab on the side of the screen, or by clicking the Preview button on the menu bar at the top of the page. As you work in the Create Event page you will want to preview your event to make sure everything looks the way you intend it to. The Preview menu option lets you instantly preview your work in progress and see exactly how your event will look as a webpage. 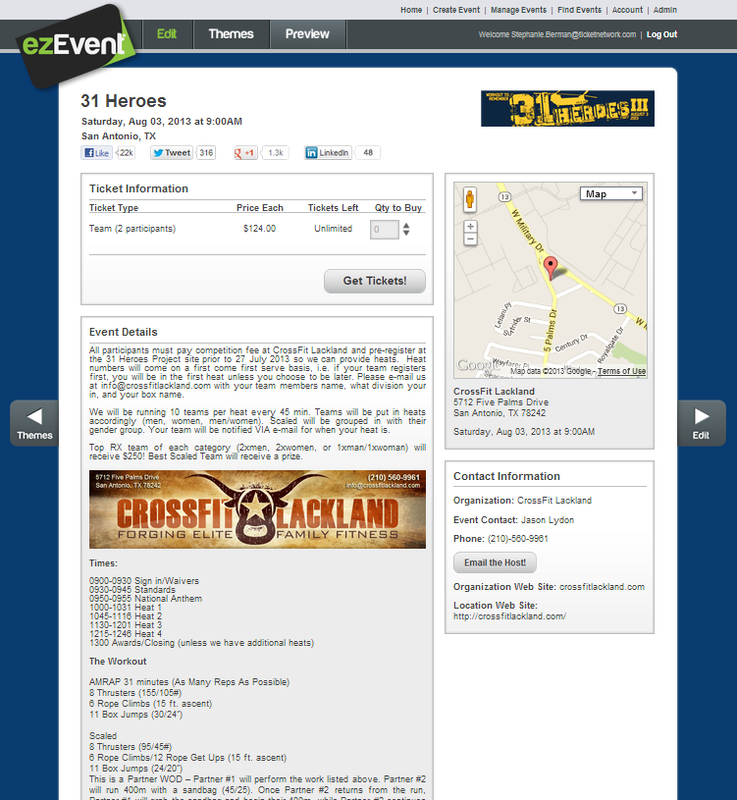 You can view your tickets, see the event details, and check out the style elements on your page. Your preview may look a bit strange before you enter all of the details for your event, but as you complete the fields on the Create Event page and make selections on the Themes page, your Preview screen will develop simultaneously. The Preview button works in tandem with the Create and Themes buttons to let you define and style your webpage. When you are satisfied with the appearance of your event page, click either the Save Draft or Go Live! button at the bottom of any of the pages. If any errors are found in your selections, you will be able to return to the Create Event page to correct your entries before saving your changes by clicking the Save Draft or Go Live! button again. The Preview page is divided into sections that correspond to the information you enter on the Create Event page. Each section of the page is expandable, and the overall page will elongate to accommodate large content. Please be advised that if you include very large amounts of information in the Event Details or Organization Details sections, the extended content will stretch these sections on the page vertically. The resulting event page may appear a bit off balance, with blank spaces in some sections in relation to the large amount of content in others. The top left portion of the Preview page contains the Event Name, event Start Date and End Date (if any), and the City and State of the event Location. The top right portion of the Preview page will display the event or organization logo if a graphic file was uploaded on the Create Event page. The Ticket Information box is located on the left side of the Preview page just below the Event Name, Date, and Location. The Ticket Information box contains a list of the Ticket Types that you defined on the Create Event page. Ticket Types will display in the order that you define them, or in the order that you arrange them on the Create Event page. The "Qty to Buy" column is visible within the Ticket Information box. The quantity and number of Tickets Left, however, can only be changed on the Create Event page, not from the Preview screen. The information entered in the Event Details field under the Why section of the Create Event page displays in the Event Details box along the left side of the Preview page. This box is located below the Ticket Information box. If no information is entered into the Event Details field on the Create Event page, the Event Details box is omitted on the Preview page. This section expands infinitely to hold all the text that is entered into the Event Details field on the Create Event page. The information entered in the Organization Details field under the Who section of the Create Event page displays in the Organization Details box along the left side of the Preview page. This box is located below the Event Details box (if one exists) or below the Ticket Information box (if no Event Details box exists). If no information is entered into the Organization Details field on the Create Event page, the Organization Details box is omitted on the Preview page. This section expands infinitely to hold all the text that is entered into the Organization Details field in the Create Event page. This is the last data box along the left side of the Preview page. If the Display Map checkbox is selected in the Where section of the Create Event page, an interactive Google map will appear on the Preview page. For the map to display properly, a valid city and state, or zip code for the event location must be entered in the Where section of the Create Event page. The map will appear in the upper right portion of the Preview page just below the logo (if any). The map will pinpoint the location of the event if an actual street address is entered. Otherwise, the information provided is used to display a map of the center of the zip code or the city/state combination. If the Display Map checkbox is not selected on the Create Event page, this space on the Preview page displays only the Address and Date details described below. The actual address, including the Location (if any) and the physical address of the event, are included below the map on the right side of the Preview page. Below the address, the Start Date/Time and End Date/Time (if any) for the event will be displayed. If the Display Map checkbox is not selected on the Create Event page, the Address and Date details will display in place of the map. Below the Address information on the right side of the page is the Contact Information box. This box lists the Host/Organization Name, which was entered in the Who section of the Create Event page, followed by the Event Contact and the Event Contact’s phone number. The Event Contact is taken from the Event Contact (First Name and Last Name) fields on the Create Event page. The Event Contact may differ from the person who is creating the event page on ezEvent®. The person who creates the event page has the option to create a New Contact and select this person as the Event Contact. To do this, click the “+New Contact” link within the Who section of the Create Event page and fill in all of the required information. Click the green Save Contact! button. The contact you enter will be added to a drop down menu in the Who section on the Create Event page where you can then select that person as the Event Contact. 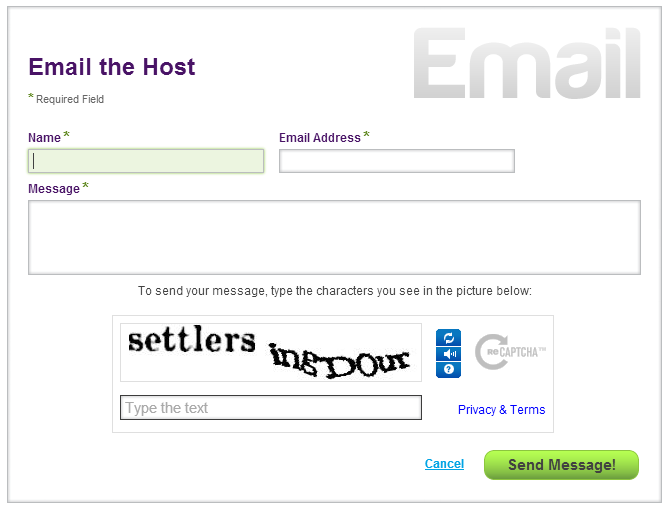 Within the Contact Information box, you will also find a large Email the Host button. Attendees can click this button to communicate with the Event Contact via email. When the button is clicked, a page will pop up where the attendee can enter a name, a subject, and a message for the host. To prevent spamming, ezEvent® never displays the Event Contact's email address. Below the Email the Host button, you will find the Organization Website (if provided on the Create Event page) and Location Website (if provided on the Create Event page). When you are done with the Preview page, you can switch back to the Create Event page, move to the Themes page, or click the Save Draft or Go Live! button to validate your entries and save your event.